Home › Pix of the Trade › Vegas on ice! The Las Vegas Convention and Visitors Authority hosted a group of travel trade personnel to a hockey game in Toronto last night (Nov. 6) as the Maple Leafs played the Las Vegas Golden Knights. The Knights have been a big attraction for Canadians visiting Las Vegas, which will add an NFL team next year when the Oakland Raiders will be relocated and will call Vegas home. 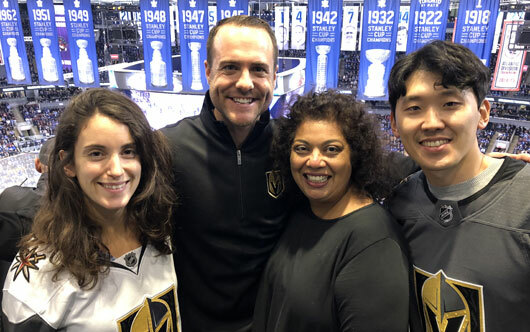 Pictured at the game is the Vegas Canadian team of (l-r) Stephanie Freed-Burns, Brian Edwards, Charmaine Singh, president and CEO at Reach Global Marketing, and David Han. Just for the record, the Leafs won the game 3-1.